Highland's 309 dispenser for the clinical setting utilizes a removable cover to fill. 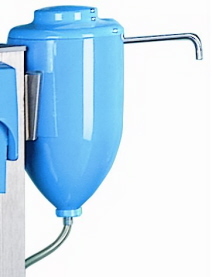 Using the time-tested and patented Highland foot-pump dispensing system, this unique design dispenses the soap/solution in a completely hands-free way. As with all Highland foot-operated dispensers, air from the foot pedal never comes in contact with the product being dispensed. Highland Labs specialty designs have helped hospital personnel prevent the spread of infection since 1953. Each system is engineered for long life and trouble-free service. Click here for the Spanish brochure!